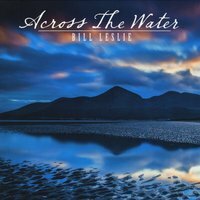 Serving as a bookend of sorts to his highly praised 2013 release, Scotland: Grace of the Wild, Bill Leslie's Across The Water is the pinnacle of this superb artist's discography. As with Scotland: Grace of the Wild, the hugely talented multi-instrumentalist once again was so inspired by a trip, this time to Ireland, that he recorded an album to capture his memories in music. Leslie was deeply moved by the natural beauty of the landscapes, the inherent charm of the people, and the utterly magical atmosphere that seems to permeate Eire. The music which has sprung forth is equally beautiful, haunting, charming and totally beguiling. Many times in previous reviews of Leslie's albums I have compared his music to that of the seminal Celtic fusion group, Nightnoise (who recorded on Windham Hill). With Across The Water, that comparison reaches its zenith. Each of the CD's ten tracks wears its Irish/Celtic influence proudly on its sleeve. In fact, in some ways, the music here is even more rooted in the traditions of the Emerald Isle than some of Nightnoise's albums. That is not meant as disrespect to that pioneering group but more of a categorization of the music on Leslie's latest release. While there are two traditional Irish songs on the disc, Bill Leslie's ten originals hew ever so closely to the typical motifs of Irish/Celtic music. Perhaps there is an element of fusion present, although the core, the essence of these pieces, certainly clings to ages old musical influences nearly every minute of its 41-minute run time. As he does on every album, Leslie enlists the talents of some truly gifted musicians. Across The Water is graced with appearances by Joseph Akins (piano), John Brown (bass), Brandon Bush (accordion), Jennifer Curtis (violin), Nancy Green (cello), Melanie Wilsden (oboe), Anita Burroughs-Price (harp), and in a brilliant star turn, Brian Dunning (one of the founding members of Nightnoise) on flute and pipes on two tracks. Leslie, one of the more gifted and versatile multi-instrumentalists recording today, plays piano, guitar, keyboards, and Celtic whistles. The assembled performers play tight, with a capital T. These artists sound like they have played together all their lives. And do they play! Whoever takes the lead on a piece weaves a beautiful tapestry to which the other musicians then contribute various "thread colors" with the end result being quilts of musical magic, flowing with a soft serenity and subtle sensation of haunting beauty. So vividly do Leslie and crew paint their sonic portraits that while listening to the album, one can almost picture lush green fields, rolling hills, quaint villages, and ancient castles lit by the setting sun. Almost all of the music on Across The Water is relatively low-key, i.e. don't expect any jigs or reels. Some tracks are gentle and soothing, others have a light-hearted but subdued cheerfulness to them, and some evoke the deep-rooted beauty of Ireland's mixture of rocky inlets, bucolic pastures populated by sheep, and ages old walking paths crisscrossing the landscape. In some ways, Across The Water (and also Scotland: Grace of the Wild) remind me of Bill Douglas' Celtic-influenced releases on the Hearts of Space label (e.g. Circle of Moons and Songs of Earth and Sky), although Douglas' music features choirs prominently as well as sometimes venturing into a more uptempo style. However, both artists' albums feature superb compositions played with talent, heart, and sincerity, filled with music which touches the heart deeply and worthy of many repeat playings. It amazes me that Bill Leslie has had such a long and praiseworthy recording career while also being an award-winning television journalist in Raleigh, North Carolina (WRAL). He has won 2 Peabody awards and 5 Emmys. That would be more than enough for most men, but Bill Leslie is not most men. He is a talented and sensitive interpreter of the beauty in the world, using music as his language. Across The Water is testament to just how good he is at that aspect of his life. The album is a must have for all lovers of Celtic/Irish music who will be enchanted from the first minute to the conclusion of the last track on this excellent album.